The Farr 40 One-design Class is unique within the world of offshore yacht racing, having been a pathfinder during a period of great change within the sport. While major events around the world like the Admiral's Cup in the UK and Kenwood Cup in Hawaii were in terminal decline, this 40ft Bruce Farr® designed yacht has shone like a beacon on a distant shore. 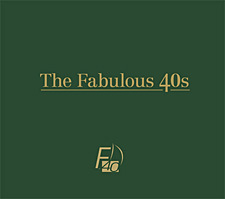 The lavish, limited edition The Fabulous 40s book produced with the support of long-time Farr 40 Class sponsor Rolex, tells the story behind this remarkable Class. 152 of these boats are now spread across 19 countries, making it the most successful internationally recognized offshore racing class in the world. Key to this success lies only partially with the enduring beauty and sleek lines of its design. What really made this Class so successful is the fact that the yachts are owner-driven, quite literally. It was the idea, unique at the time, that owners - all amateur helmsmen - should be alone in having their hands on the helm during Class racing. Previously, owners had, by and large, become hostage to their crews, forced to hire the best 'guns' in the sport to gain any success, while they rode the stern as passengers, their only active role, to write the cheques. Innovations: The Farr 40 Class was also the first to introduce the concept of an offset windward mark to lessen the chance of collision between yachts closing on the windward mark with those running back under spinnaker, first to include a leeward gate, and first to instigate an 'open-mike' policy, giving competitors the opportunity to listen in on all committee boat transmissions. The boat's international appeal was immediate. The first 10 went to owners in five different countries. The design also won the 'Boat of the Year' award in 1998. Judge Betsy Alison noted. "All who have sailed in this class agree that the boat takes the sea in its stride. It is fast, very fast, with marvelous responsiveness and maneuverability and high structural integrity." The Fabulous 40s traces the rise of this unique Class which has attracted just about every big name within the sport including: Matt Allen, George Andreadis, Guido Belgiornio-Nettis, Ernesto Bertarelli, Riccardo Bonadeo, John Calvert-Jones, John Coumantaros, Dario Ferrari, Crown Prince Frederick of Denmark, Helmut Jahn, Philippe Kahn, John Kilroy, Irvine Laidlaw, Massimo Mezzaroma, Antonio Sodo Migliori, Vincenzo Onorato, Richard Perini, Hasso Plattner, Eduardo Ramos, Jim Richardson, Peter de Ridder, John Thompson, Philip Tolhurst, Graham Walker and Lang Walker. Lavishly illustrated with more than 350 pictures, many of them double page spreads taken by some of the best photographers in the world, including Carlo Borlenghi, Daniel Forster and Kurt Arrigo, this 240 page book captures the close racing and comradeship between crews competing in many of the best locations in the world. This is a book for all yacht race enthusiasts and lists the results of all the Rolex world champioships from 1998-2011 as well as owners and their yachts.